Vitamins and minerals are a key part of nutrition, and I realized that I haven’t been addressing them a lot here. I lean towards a “whole foods” approach of nutrition. For the average person, it is incredibly time-consuming and therefore, in my opinion, unreasonable to calculate the exact amounts of particular nutrients. It is better to keep the big picture in mind, and “eat food, not too much, mostly vegetables” (to borrow from the tagline of Michael Pollan’s book “In Defense of Food”). However, vitamins and minerals are key components of healthy nutrition, and it is my job as a dietitian to educate consumers about them. So, welcome to my version of Vitamin D 101. Vitamin D is a fat soluble vitamin, and is sort of an outlaw among the vitamins. As most people know, the body can synthesize vitamin D from the sun. And, even though it is called a vitamin, it is technically a hormone because it is a chemical messenger that causes a response in the intestines, kidneys, and bones. Vitamin D regulates calcium and phosphorus absorption, and is therefore very important for bone mineralization and strength. In addition, research suggests that vitamin D helps to maintain muscle strength, promote a healthy immune system, and help regulate cell growth and differentiation. You can get vitamin D from food or from the sun. When UV light from the sun hits the skin, it reacts with 7-dehydrocholesterol (a vitamin D precursor made from cholesterol in the liver) to create cholecalciferol (vitamin D3). This cholecalciferol, and vitamin D from foods, are converted in the liver to 25-hydroxy vitamin D, then sent to the kidney to be converted into 1,25-dihydroxy vitamin D3, the biologically active form. Several factors that contribute to vitamin D deficiency include: lack of vitamin D in the diet, dark skin, lack of exposure to sunlight, and liver or kidney disease. It is estimated that more than 50% of men and women ages 65 and older in North America are vitamin D deficient (2). There are not many foods that naturally contain vitamin D. Therefore, in the United States, most dietary vitamin D comes from fortified foods such as breakfast cereals, milk, soy milk, and margarine. Regulations state that all commercially available milk must be fortified with 400 IU/quart (3). The RDA (Recommended Dietary Allowance) for adults ages 19-70 is 600 IU of vitamin D a day, and for adults over 70, the RDA is 800 IU. (For an explanation of RDA, refer to my post on Alphabet Soup). The UL (tolerable upper intake level) for all adults is 4,000 IU (4). Dark skin, increased age (individuals aged 65 and over generate only 1/4 as much vitamin D as individuals in their 20’s do), and lack of exposure to sunlight inhibit the synthesis of vitamin D from sunlight. Research indicates that people who live above 37 degrees northern latitude have insufficient duration and intensity of sunlight exposure for optimal synthesis (2). There is much more that can be said about vitamin D, such as medication interactions, disease states, risks of toxicity, etc. but that’s a bit much to fit into one blog post. I hope you’ve enjoyed learning a little bit about this vitamin! (3) Nelms, Sucher, and Long. Medical Nutrition Therapy and Pathophysiology. Categories: Clinical Nutrition | Tags: fat soluble vitamins, RDA, UL | Permalink. I was sitting in on a Sports Nutrition class this morning, and was reminded of how complicated some of the terms and abbreviations used in nutrition recommendations are. So, I thought I’d take a few minutes to outline and explain a few terms. I’ll quote the textbook definition, and then try to explain it in even more simple and easy-to-understand words. I hope this helps you to make sense of out of some of the alphabet soup! AI: Adequate Intake. “The average daily amount of a nutrient that appears sufficient to maintain a specified criterion”. 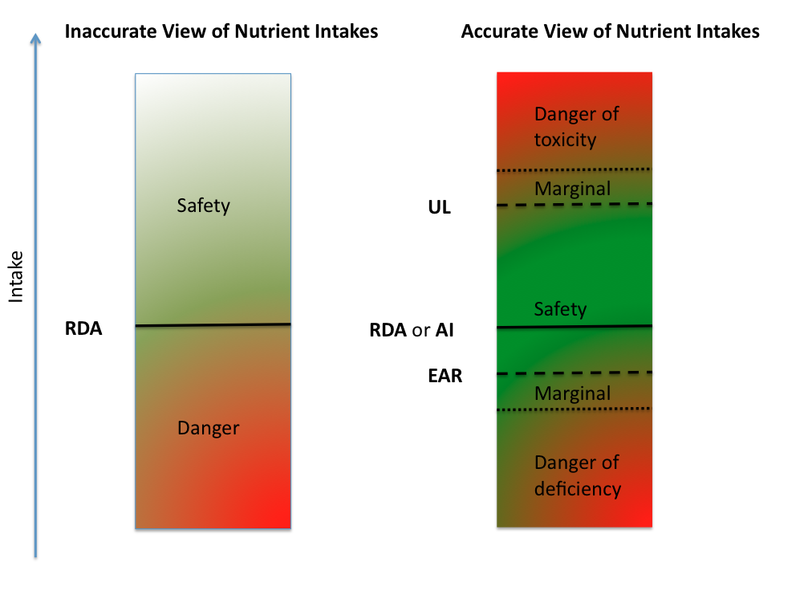 The AI is basically the same as the RDA, except that a specific value cannot been determined for that particular nutrient. The AI is a very educated guess. Well-known nutrients that have an AI are Vitamins D and K.
This is a reference for the appropriate percentage of daily calories that should come from each of the macronutrient categories (carbohydrate, fat, and protein). This amount can vary from person to person. For example, an endurance athlete would want to take in a percentage of calories from carbohydrates towards the upper end of that range, since carbohydrates are the fuel for activity. So, DRIs is the larger category of references discussed in the rest of this post. You probably won’t come across this term too much, but it’s simply an estimate of what a typical individual needs. However, since this recommendation is not sufficient for potentially up to half of a population, nutrition guidelines typically use the RDA. In other words, if over the course of time you meet the RDA of the various nutrients, you’re almost certainly consuming enough for your body’s needs. I assume that the average individual is familiar with this term, and would likely equate it with the % Daily Value that is written on the nutrition facts label of the foods that you buy. The Daily Values used on labels are based on a 2000 calorie diet, partially derived from values from the 1968 RDAs. Since 1997, RDAs that reflect newer scientific research have been released, and efforts are being made to update the daily values on food labels. Yes- it’s not a beneficial thing to consume nutrition supplements that claim to contain “300% of your Daily Value!” If they are water soluble, your body will simply excrete the excess vitamins, and if they are fat soluble you could easily approach toxic levels. To help illustrate some of these points, I’m going to borrow Figure 1-6 from “Understanding Nutrition: 11th Edition” by Whitney and Rolfes. Categories: Community Nutrition | Tags: AI, AMDR, dietary intake, DRI, EAR, fat soluble vitamins, RDA, UL, water soluble vitamins | Permalink.